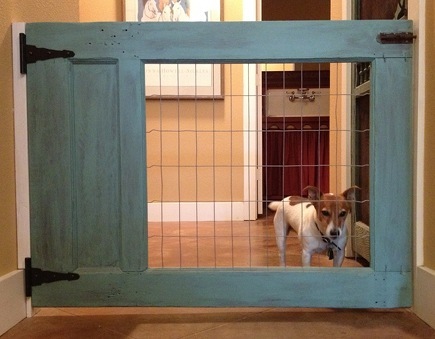 A collection of ideas for custom pet gates to keep furry friends safe at home. Keeping our pets safe sometimes means they need to be contained or kept from getting underfoot. So they can still feel like part of the action, custom pet gates — in keeping with house style — are just the ticket. These examples all have wood frames with center inserts that allow pets to keep their humans in sight. This creative pet door [top] was crafted using half of an old door. For a rustic look, the glass was replaced with wire fencing. The paint appears to be washed on, to give it a thinner appearance than paint applied with a brush. A soft blue personalizes the gate even more and large hinges provide the needed support as well as charm, while a barrel bolt keeps the gate closed. Don’t tell Mr. Shops, but his To-Do list just got one project longer. 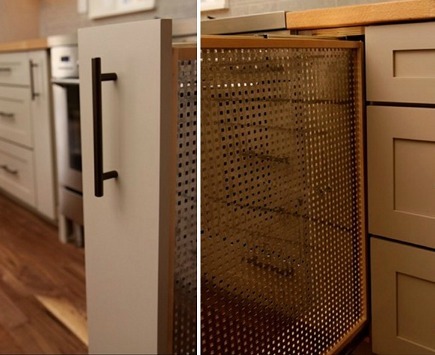 Rev-A-Shelf makes this base cabinet stainless steel filler pullout for organizing cooking utensils. I’ve spliced together two photographs for easier viewing. A piece like this could be utilized to keep pets (and children) away from the range when it’s going and a matching pull-out could be placed on the other side, too. During construction or remodeling it could be designed to use elsewhere in the home. A full-extension drawer glide is attached to the top of the wood frame, similar to the idea used for our TV in Disguise. Most dog owners know how it is when the doorbell rings — chaotic! This pocket gate closes off the living area from the foyer. The woven lattice inserts and frame are the same finish as the rest of the trim, so it blends in perfectly with its surroundings. 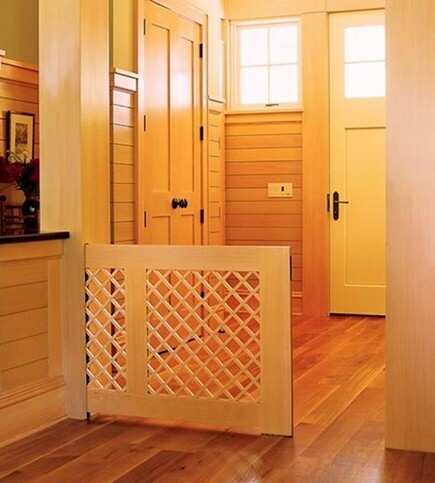 For more pet friendly ideas, don’t miss Built-ins For Pets and Custom Stairway Gates. Wow, those are some nice pieces of art you got there. Compared to the usual pet gates you see around, these are like the cream of the crop. May I ask how much do the gates shown on the site went for, ball park? Phillipe, the first and last sources did not discuss price. The first gate wouldn’t cost much, since it is made from an recycled door. The last one would cost more since it is custom and larger. Do you have any “how-to” information for the pocket door in the last picture. I’m interested in knowing what kind of hardware is used. Thank you! I don’t, Anne, but Custom Home Online (the source) might have some info. I image it can be replicated with wheels or rolling balls to easily open and close. An inset (lift up) pull on the end to assist open/closing.